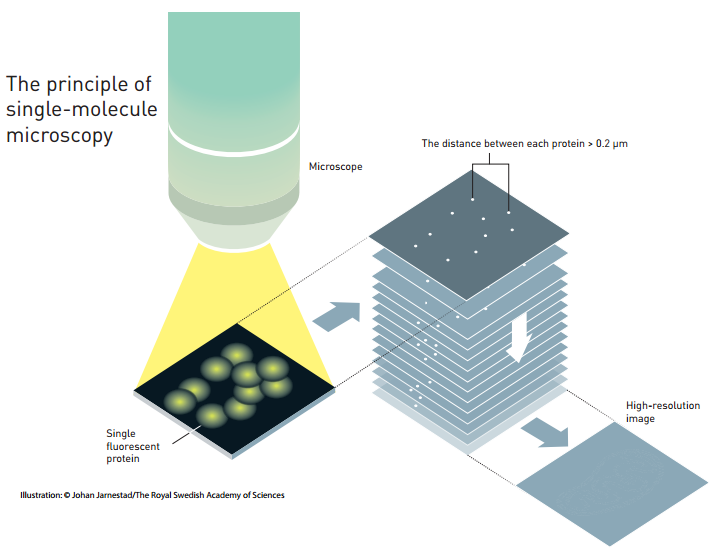 The Royal Swedish Academy of Sciences has awarded the 2014 Nobel Prize in Chemistry to Eric Betzig (Janelia Farm Research Campus, USA), Stefan W. Hell (MPI Biophysical Chemistry & DKFZ, GE) and William E. Moerner (Stanford University, USA) “for the development of super-resolved fluorescence microscopy”. 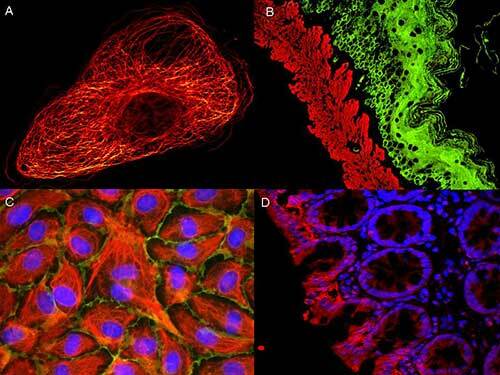 These fluorescent-based methods allow microscopy to enter into the “nanoworld” (nanoscopy instead of microscopy) and to give Life scientists hyper-resolutive images. Evaluation of AKT activation using STED nanoscopy and mouse anti-AKT pS473 (p/n 200–301–268, Rockland) and ATTO 647N conjugated anti-Mouse IgG. 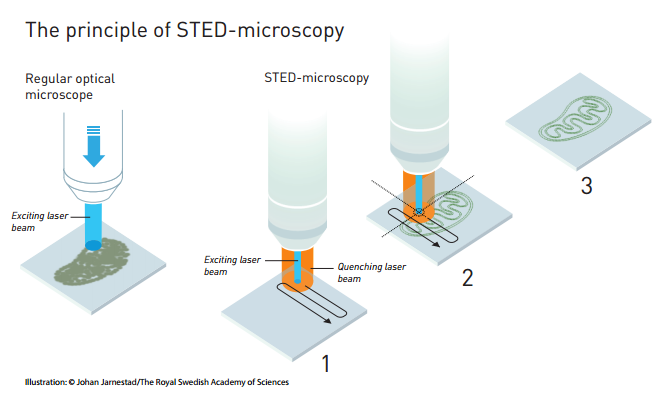 Source: Leica Microsystems. Courtesy of Leica Microsystems / Rockland Immunochemicals. 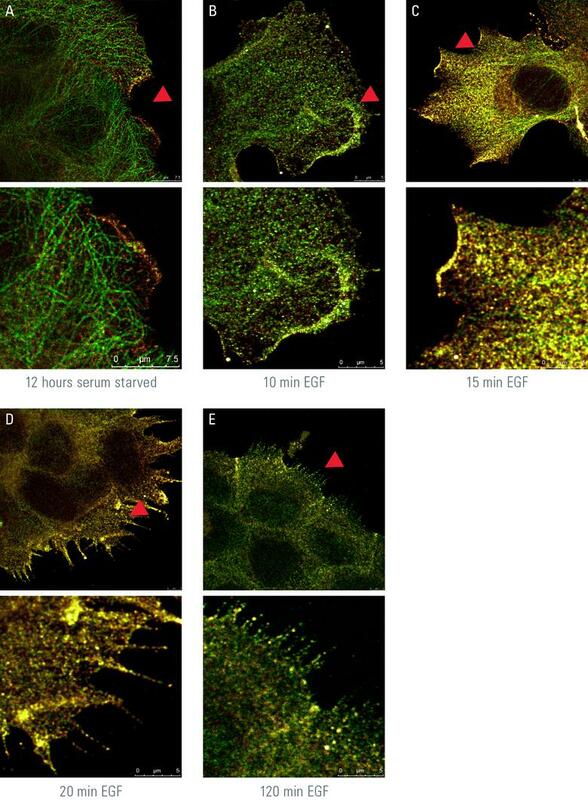 ATTO 425 conjugated anti-Mouse IgG was used to demonstrate 2 color STED immunofluorescence microscopy. Methanol fixed A431 cells probed with an anti-tubulin detected with ATTO 425 conjugated anti-MOUSE IgG (610-151-121) secondary antibody (colored RED). 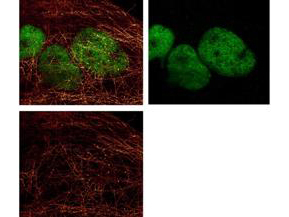 In green, anti-HDAC-1 [RABBIT] (p/n 600-401-879) detected with DyLight™488 conjugated anti-RABBIT IgG secondary antibody. Source: Myriam Gastard – Leica Microsystems & Rockland Immunochemicals.